See how to reduce the total time to troubleshoot an issue with WinRM to just a couple of minutes instead of an hour or more. Many VSTS build and deploy tasks are based on WinRM to operate on a remote machine. One of the most common is “Deploy TestAgent on,” which will install a test agent on a remote machine. Figure 1: Task to install a TestAgent on a different machine. Error occured on ‘yourmachinename:5985’. Details: ‘Connecting to remote server jintegration.cyberpunk.local failed with the following error message: The WinRM client cannot process the request. If the authentication scheme is different from Kerberos, or if the client computer is not joined to a domain, then HTTPS transport must be used or the destination machine must be added to the TrustedHosts configuration setting. Use winrm.cmd to configure TrustedHosts. Note that computers in the TrustedHosts list might not be authenticated. You can get more information about that by running the following command: winrm help config. For more information, see the about_Remote_Troubleshooting Help topic.’. For troubleshooting, refer https://aka.ms/remotevstest. This error can happen for various reasons — firewalls, trust, misconfigured WinRM, and so on — but the annoying stuff is: each time you change some configuration to solve the problem, you usually re-schedule a build and need to wait for the build to complete to understand if the problem is gone. This actually kills your productivity. Whenever possible, try to verify if the build is fixed without queuing another entire build. 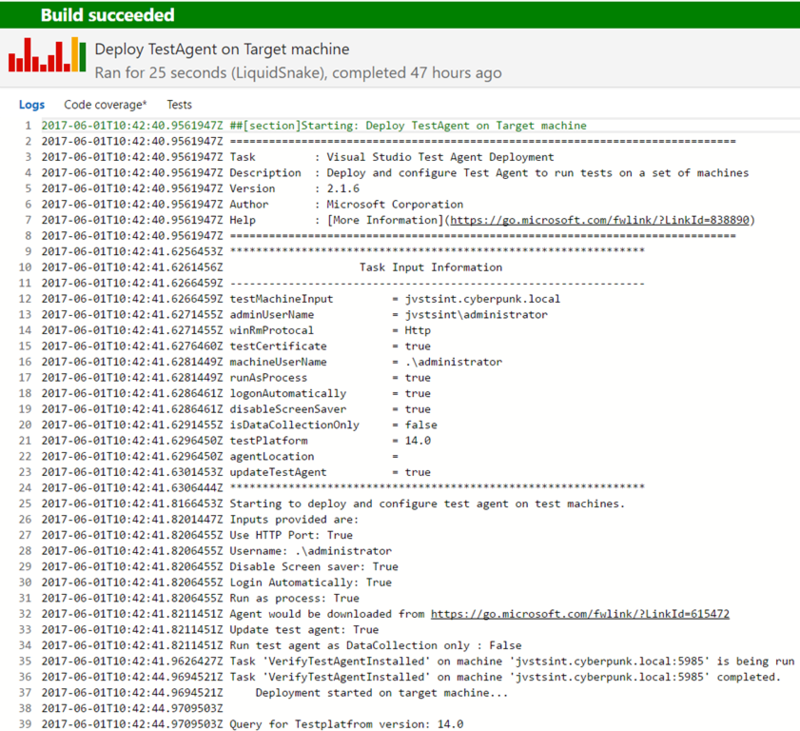 In the new VSTS build, the agent is running simple tasks. Most of the time, they are composed by PowerShell scripts, so it is really better running scripts manually to verify that your problem is gone instead of launching another entire build. In this scenario, the problem is WinRM configuration, and you can use a simple winrs command from the machine where the VSTS Agent is running. This simple command will try to execute the dir command on the computer jintegration.cyberpunk.local using WinRM. If you see the result of the dir command, it means that WinRM is configured and the computer can be contacted and it accepts WinRM commands. If you have any errors, you should check your configuration and retry again. Once the winrs command runs fine, communication between the two machines is okay. The important aspect is that until winrs command gives you an error, you can be 100% sure that your build will not complete. Replicating the commands issued by the build agent outside the build greatly reduces the time needed to solve the problem. In my situation, this is the set of commands I’ve run to be sure the winrs command works. Ensure that WinRM is enabled on both computers with command winrm quickconfig. Verify that the target computer port 5985 is opened for connection. RemoteComputer is the name of the other computer. If you want to do a quick test, you can specify * as the Remote Computer name. After these three steps, I was able to execute the winrs command. Then, I queued another build to verify if the task was working. Figure 2: Deploy test agent task now runs without error. Actually, I’ve done several things to troubleshoot the reason for the error, but since I checked each time with a simple winrs command (instead of waiting for a four-minute build to run), the total time to troubleshoot the issue was few minutes instead of an hour or more.